This post is my entry in the Eukanuba Paws In Motion to BarkWorld sweepstakes. Extroverts thrive in social settings drawing energy from being around other people. I’m an introvert. We’re often thought of as shy, rude or antisocial, but this shows how misunderstood we are. Introverts are drained by social interactions and draw energy by focusing inward. The Internet can be a haven as it gives introverts a chance to be social in a way they are comfortable with. Even with the advantages of being online, there are some characteristics of being an introvert that affect my blogging. Introverts are private. We don’t like to talk about ourselves and are more comfortable having conversations with people we know. So while I love reading all the stories people write about their pets, I find it hard to do on my blog. Introverts prefer deep conversations over chit chat. So when it comes to commenting sometimes I don’t because I don’t feel comfortable doing it unless I it seems to add to the conversation. Introverts need time to process information before responding. This is the number one reason I love the Internet. I can take time to leave a thoughtful comment, but the delay means I often I end up not commenting because too much time has passed to take part in the conversation at least in my mind. Introverts find certain situations draining and for me one online situation is social media. There just seems to be so much information flying at me that I have a hard time determining what is relevant to me. So why can’t I just do these things? They aren’t difficult, how hard can it be to leave a comment? If only it were that easy, but it’s hard to change something that is an inherent part of you. One study found that introverts and extroverts have different brain activity and this plays a big part in our personality. So it’s no easier to change some of what my mind thinks about these things than it would be for me to all of a sudden be shorter. 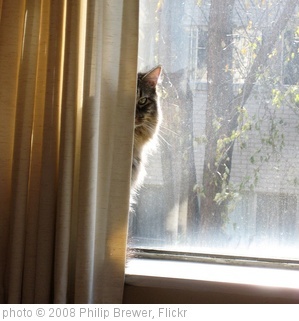 With these attributes, why would an introvert want to win a trip to the BarkWorld conference? After all, there are people I don’t know and brand representatives I have to talk to about myself and my blog. Well, meeting other bloggers will mean they are no longer a stranger to me so I’m more comfortable in joining in their conversations and posting about myself and my pets. Meeting brand representatives will give me practice in promoting my blog. Attending the sessions will give me more knowledge and skills to work with my blog especially those activities I’m not comfortable with. I want my blog to grow and I want to grow as a blogger and a conference is the place to do it. Good luck to you! I hope you get to go! As the girl known to her real life humans as particularly “quiet,” I can relate to nearly all of this (as I have no trouble whatsoever blabbing about my pets online or otherwise), and I felt exactly the same way about attending BlogPaws last year. This is, in fact, the first blog comment I’ve left (anywhere) in weeks (because I just got overwhelmed). (sigh) So thank you for writing and posting this, you have no idea how much it helps to know I’m not the only one (and that my feelings are completely normal). I hope you win Dawn and I don’t think you should feel bad about going back and making a comment. For my blog I get an e-mail anytime someone comments so I always check those out. Also if you are a new reader to a blog you may be going back and looking through previous posts and one might resonate with you. Always feel free to leave any type of comment on my blog. I promise I read them all. Great post! I feel the same way, but I’m planning on going to both BlogPaws and BarkWorld this year. I hope you win the trip to BarkWorld and we can meet up and say hello. Good luck! Thanks everyone! Glad to know I’m not the only introvert. I did go to BlogPaws last year and would have loved to have gone again, but unfortunately my budget is a bit small this year and June is a bad time of year as most of my co-workers (who have more seniority then me so get first pick of time off) are off that month. I didn’t enter any of their contest because I didn’t want to take away a chance for someone else to go in case I couldn’t. I did enjoy although I was less anxious about moving 3000 miles away from family and friends than going to a conference by myself. I took my Springer spaniel and she ended up being more anxious than me so at least I had something to keep my mind occupied. Jodi- your right, I shouldn’t feel bad, but I do. I just need to get past my discomfort and start doing it. Elizabeth- I knew I was an introvert but haven’t thought to much about it until lately. A friend at work started telling me about her introverted husband and son and she was describing me. I felt like I found my people!! I’ve been reading more about it and it’s nice to know I’m normal. Colby- If I get to BarkWorld I will be sure to say Hi! In the mean time I can’t wait to read how your experience with Blog to Biz.